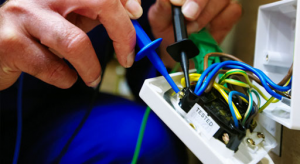 Stretch Electrical Ltd specialises in the electrical safety testing sector, covering such services as portable appliance testing, fixed installation testing, electrical installation and remedial works and emergency lighting testing. Whether you require one engineer for an hour's PAT testing or several teams of electricians to complete a full site refit, Stretch Electrical can help. Increased energy efficiency is not just about saving the environment; it's about driving down costs in order to free up capital, which can then be re-invested back into the business. We provide paid surveys (fire and asbestos) and free surveys, conducted in order to generate a quotation (installation surveys and lighting audits). We are also able to provide services in other Facilities Management sectors such as energy efficiency, office cleaning, fire and asbestos surveys, communications room installation and shop fitting. At all times we ensure that all of our clients receive the highest levels of customer care by providing a single account manager to liaise with your nominated contact, from the initial organization of a contract through to the provision of a report and invoice. Stretch Electrical Limited can provide national coverage for all of our services, with current contracts ranging from small offices to large retail chains. Should you have any queries please call us on 02380 361499 to discuss the matter further or visit our Contact Page to make an enquiry.